Witch Dr. is a Microgaming Slot Game Release. Play Witch Dr. at these Casinos: Golden Reef Casino • All Slots Casino • Zodiac Casino or at any of our Recommended Microgaming Casinos. 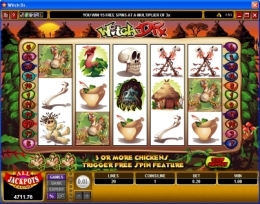 Witch Dr. is 5 reel, 20 payline bonus slot that caters to both high rollers and those with small bankrolls. Players can bet as low as 20¢ all the way up to $200 per spin. Even at the low denominations Witch Dr. pays well. Bones and Skulls makeup the lower paying symbols paying 5 coins for 3, 20 for 4 and 100 for 5. The Potion and Cauldron pay a little better, awarding 10 coins for 3, 25 coins for 4 and 125 coins for matching 5. It doesn't stop there as both the Ju-Ju Sticks and Voodoo Doll each pay 15, 40 and 200 coins depending on whether you match 3, 4 or 5 respectively. The payouts even climb higher when matching 3, 4 or 5 Plant or Hut symbols, topping off at 20, 75 and 250 coins. However, the best pays come with the Mask and Shrunken Head symbols. Get 5 Masks and you're awarded 500 coins, 100 for 4 and 50 for 3. Even matching 2 awards 4 coins. The Shrunken Head pays the best, awarding 5 coins for matching just 2 symbols, 100 for matching 3, 250 for matching 4 and a whopping 1000 for matching all 5. Like most bonus slots there is a Wild symbol and a Scatter symbol. In Witch Dr. the wild symbol is, of course the Witch Dr. and substitutes for all symbols except the scatter. 5 Witch Dr. symbols pays a massive 5000 coins. Even 1 Witch Dr. nets a 2 coin win. 5 Witch Dr. symbols at maximum coin wins and amazing prize of $50,000! Get them during the Free Spins Bonus Round and the top prize is $150,000! The scatter symbol is a Chicken that can land anywhere on the game reels and automatically awards twice your wager. Get 3 or Chicken scatters and you trigger the 15 free spin bonus round with a 3x multiplier, plus the free spins can be retriggered. Surprisingly the free spin bonus rounds occur quite often. Witch Dr. has great drum beating sound effects and colorful animations on both the Wild and Scatter symbols.